The three items of marathon running gear discussed will get you through all that hard training and help you perform at your best on the big day itself. And as a fourth bonus item, grab your FREE Marathon Starter Plan getting you in perfect shape for race-specific training. 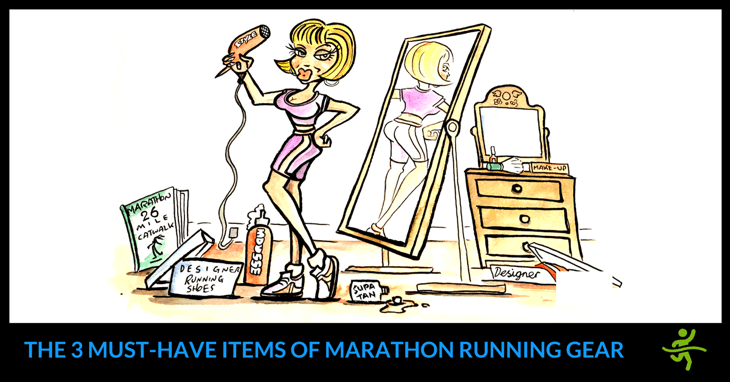 What ‘must-have’ items of marathon running gear can you add? Please share them in the comments below. Mark: Some of you of a certain age may remember Dame Vera, well Dave’s lady of the moment is actually Vain Vera. So Dave, would you like to explain who Vain Vera is and why she’s important to runners? One of the 26 that demonstrate the challenges that hold runners back from getting the times that they truly deserve over the marathon distance. Her problem isn’t some kind of training technique mistake or anything like that, she’s just damn vain! She just turns up for training or a practice race or the marathon itself. And she’s more concerned with outward appearance and image than any proper preparation or any attention to how she should be performing on the day. I’m not being sexist here, because I’m basing this on experiences going back through my 30-year competitive running career. I’ve seen countless numbers of men and women wearing the most outrageous expensive new gear, including new running shoes. Which is an absolute no-no if you’re turning up for a race. It was like a corn flakes ad, and yet you never saw them at the end! Mark: So really what you’re coming down to is the fact that they were buying inappropriate running gear because of how it looked or the label on it. Rather than whether it was going to help them actually get a good time running. Dave: That’s right, and we all suffer from that. I’ve got a kind of a thing with Apple products! But we’re being heavily marketed to all the time. And these marketing companies would have you believe that every item of gear is critical over and above your own endeavours and your own hard graft and grit. It’s a hard, individual challenge. Mark: Obviously we can’t talk about every piece of gear. So what would you say are the three pieces of gear that every runner should choose because of what they do for them? Dave: Well paring it down to just the three, and I’m glad you’ve given me that challenge, number one is running shoes. You’ve got to have the right pair of shoes. And that doesn’t mean the pair of shoes that one of the big companies has told you is the right pair. Your technique on the treadmill is carefully analysed. In terms of its stability and its cushioning and factors like that. Mark: When you say a quality running store, that’s not somewhere like one of the big chains? Dave: No! When you’re doing as something as serious as a marathon event, please go to a running store. Mark: So that would be in the local area to where people live? Dave: Yeah. I don’t think with the massive growth of online retailing, people in the running stores get the credit they deserve, because you get that service. Attending to your needs and taking the time and trouble to assess your action and then matching you up with the perfect trainer. Mark: And then I suppose you could assume couldn’t you that the people in the running stores are runners themselves, would that be fair to say? Dave: 70-80% I would say. I can think of one who’s an ex-international. Mark: So they know the problems that people are going to have? Dave: You’re going to be in good hands, yeah. Mark: Well that’s shoes, two more Dave. You can’t get away from having a decent running watch. Because you need really accurate GPS. Because you need to be knowing for these very specific sessions like Faster-Longer Runs and Marathon Pace Runs, that you are accurately gauging distance. If you’re slightly out that can actually have a huge bearing on the accuracy of your training and therefore the accuracy of your fitness development. Dave: You can factor in things like gradient and look at the effort level by pairing it up with a heart rate monitor as well. So when I say watch what I basically mean is some kind of pace and effort monitoring equipment. Mark: So we’re going to be looking at those in more detail on another show? Mark: So we’ve had the first one, which is the shoes, the second one, which is the watch, what would you say the last crucial piece of kit is? Dave: Well the third one is wickable clothing. And gone are the days now, particularly for preparing for a marathon and doing all of those miles in all kinds of weather to be running around in a cotton t-shirt! It’s absolute trauma if you’re going to be training for an autumn marathon during the summer to be coming back drenched in sweat! Just get some really good wickable running tops and running shorts and get running socks that are blister proof and go the whole hog. A marathon schedule can cross different seasons at a time. And then on the other be prepared for torrential downpours or snow or whatever. So make sure you’ve got some good outer layering that’s windproof and able to wick moisture. Running socks is possibly the next biggest thing we get asked about a lot (after shoes). Generally there’s lots of different brands, and there’s lots of different versions. Personal preference is paramount as always, because your best friend may run in a thick sock but you might hate a thick sock. So it’s a bit of trial and error in working out what is best for you first. One of the things we hear about all the time is people experiencing blisters when they run. One thing to try is a double layer running sock. Hilly do a version that’s got two layers to the actual sock. So one of those layers moulds to your actual foot as you run, the other layer sits outside of that. As opposed to between your poor foot and the sock! Next to that you’ve got just a one layer running sock, which is a nice, lightweight sock. As opposed to a standard cotton sock that will just absorb all the sweat while you run. Which will then dissipate that as you run. If you’ve got a cotton sock it just holds all the sweat in, and then this can cause blistering. So that’s a light one layer sock. Some people prefer a thicker padded cushion sock, a couple of variations of these. Some add a padding through the entire length of the bottom of the sock. Which sounds a bit like luxury, but for some people that can be a little bit uncomfortable. So there’s a thinner version of this where you’ve got the padding just on the impact zones. So padding just on the base of the heel and the forefoot and the rest of the upper is lightweight and comes up just over the ankle. You can also get a compression running sock, and these basically come up to just below the knee. The best versions of these have got graduated compression. The idea of this is it compresses the area of the calf and stimulates new blood flow to the area. So if you do get any issues with calf cramping or any issues with your achilles tendons and tendonitis, they can sometimes help to manage that. But there’s a few different pointers out there for what different brands offer. The first would be a lycra running short. The idea of these is that through impact your muscles oscillate, which means they move slightly. The lycra will support and stabilise that movement a little bit in hope that then the fatigue through the next day will be a bit more manageable. Not so tight that you feel restricted when you’re running or when you’re moving. But enough that it feels like it’s holding everything! Alongside that you can get a baggy running short, which is lightweight. So if you didn’t want to wear underwear you’ve got something in there that is already pre-built in. Another essential factor is labels. Especially if you’re looking at longer distance running. Anything that feels like it’s rubbing or could be annoying could rub into a mark or cause quite a bit of chafing. A lot of products now have just got a printed label as opposed to a tag that flaps or sticks out. Some of them have a label that can be removed safely just by cutting. You just want to be careful that again you’re not aware of it. So that it won’t be annoying over a long period of time running. What we call a twin running short. The benefit of these is that you’ve got a baggy lycra short on the top. But underneath pre-built in is a supportive lycra tight-fitting short. But you don’t have to walk around in a pair of lycra shorts, you get the benefit of the baggy shorts on top! The key point of this clothing again is the high wicking nature of the material. This will make the material heavy, stick to you, and potentially cause a lot of chafing and discomfort when you run. Material like this, which is high-wicking is designed again to transfer all the sweat into the material and then out of it quickly. They’re very quick drying and very lightweight. You should almost feel like you’re not really wearing a great deal! This particular one is seam free, so again will reduce any issues with chafing. That’s a men’s running singlet, which people tend to use maybe in the summer time as it gets a little bit hotter. Alongside that something like a running t-shirt. Again same thing with the material, high-wicking so it’s not going to absorb any of the sweat. That’s a mesh material that’s going to be even more breathable, that follows through on the back, to protect the key points from getting too hot when running. Another addition is a long sleeve running t-shirt. This will add a little bit of extra warmth whilst you’re running in colder conditions. Again lightweight and high-wicking so it’s going to wick away the sweat quicker from your skin than a standard cotton top. See these parts on the arms that come through. The material is a little bit thicker, and that’s going to be picked up by any kind of light as you’re running on the streets as it gets darker. Or early morning if you’re going out first thing before work. Again, we’ve got mesh through the back and underneath the armpits to keep you cool. High visibility is extremely important as you get through to the darker nights and earlier mornings. If you can’t be seen by a vehicle or a cyclist or pedestrians then you won’t have any room made for you and it’s really unsafe to be running around in dark. Lots of people want to go out, not be seen. So they end up going out head-to-toe in black kit and you’re invisible to cyclists, cars and pedestrians alike on the streets. Layering is another key factor to your running apparel. Or they’ll brave it in maybe just a short-sleeve t-shirt. And then suffer from a cold the next day from being out in the elements for a long time running. If you’ve got a high-wicking layer on underneath, say for example this reflective top, you’re covering your arms. If you pop a running gilet then on top, something like this, this adds an extra layer to your core. If you keep your core warm, essentially the rest will follow. It’s the important part of your body so you need to keep it wrapped up. Something like this is lightweight and reflective. So you’re going to be visible when you’re running up and down on the roads. But it’s also going to protect your core and it’s got a windproof nature to it as well. So when you’re out in the elements and it’s raining and it’s windy, something like this is going to add an extra layer of protection to help with your layering. Alongside that you can then go into a running jacket. There’s so many different variations and there’s lots of different weights and obviously visibility ones that you can get as well. You can get ones that have got a hood. Sometimes you may find that’s a little bit annoying, because obviously if the wind is strong it may just get blown down. Something like this is a really nice lightweight running smock. It’s a half zip unit so you just pop it on and this handy bag that it comes with shows the size that this jacket will fold down into whilst you’re running. And it just means if you’re going for a longer run if the weather is subject to change you’ve got something to pop on or it’s just an easy layer to take off mid-run. This one’s high visibility so you’re not going to be missed. It’s got these dots of reflective almost like a 360 all the way around the product. So everywhere you look there’s something that’s going to be caught out by bike lights or headlights from a vehicle. And again something like that on top of a high-wicking top is going to keep you cool, you’re not going to get too overheated, and it’s lightweight. You can get fully Gore–Tex® waterproof running jackets, the price of those will increase, and you will lose out on the breathable nature of the jacket. Because the moment you go into something that’s Gore–Tex® you have fully taped seams, which will reduce the amount of air flow going through. Mark: Is there a real need for runners to schedule their exercise, for want of a better way of putting it, regularly throughout the week? Both in terms of making sure you fit in all your key sessions. But also it’s really vital to be flexible enough to make sure you train in the right conditions. Because it’s a steady bread and butter run. But what if you’re doing a very specific run like a Faster-Longer Run? Where you’re trying to achieve a certain intensity and a certain rhythm? Then I would advocate running that under ideal conditions. So if you’ve got a weather app and you can spot that Thursday is the perfect day to do that. But you’ve scheduled it for Tuesday and you swap it, you can still get the easier running done in between. But then run on the Thursday when the conditions are good. Mark: So is there any way that you can help people schedule their runs in a much more efficient way? Dave: I’ve got some software called the Smart Scheduler. The brilliant thing about it is it gives you flexibility to go through those pacing sets. But within a planned framework based on the best principles for marathon running. Like whether you’re an ostrich or a camel (we covered that in one of the previous videos). And you type in how many weeks you’ve got to train etc. Just by changing a setting to cover for weather variation or whether you’re feeling a bit under par. So for example, you could substitute a fast interval session, that’s hard work, for a more gentle Fartlek session. Where you’re just playing with speed in nice rolling parkland or something. Mark: So you developed this software for yourself in order to make your running more efficient? Mark: And I understand you use it with your clients? Mark: So does it cover all the four phases? Mark: The Trail, the Steps, the Pillars and the Pediment? And to get you started you can get instant access. There will be the opportunity to go further into the very important marathon-specific (Pillars) phase, and then finally into the Pediment phase before your marathon. Mark: There you go! You have a FREE offer of software to help you schedule your marathon running. What other things does it do, just out of interest? And it automatically gives you those dates including what day you’re doing what session. You can even switch the day of your Long Run. But if you’ve got a super-busy lifestyle with lots of family commitments, it gives you the opportunity to do those Long Runs on a Thursday. Mark: So there you go, a brilliant offer from Dr Dave, that will help you schedule your marathon running and training in a very professional way. I love everthing they got.